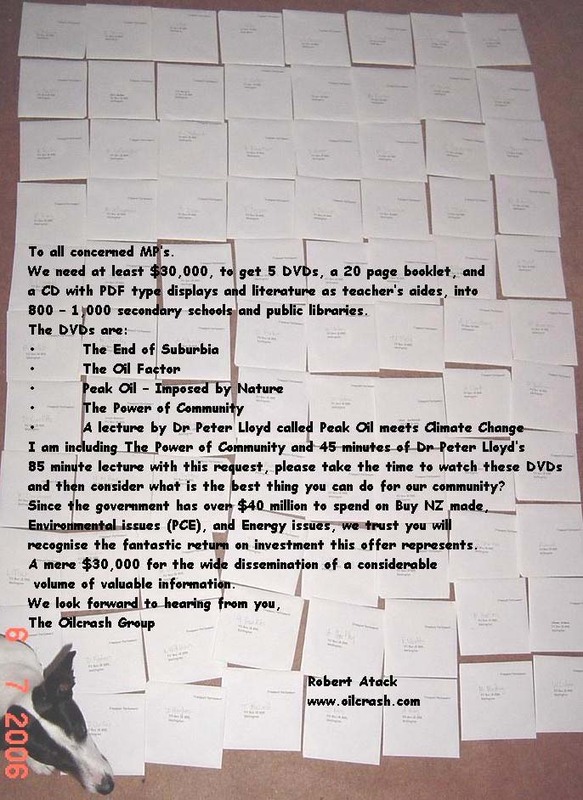 We need at least $30,000, to get 5 DVDs, a 20 page booklet, and a CD with PDF type displays and literature as teachers aides, into 800-1,000 secondary schools and public libraries. I am including The Power of Community and 45 minutes of Dr Peter Lloyds 85 minute lecture with this request, please take the time to watch these DVDs and then consider what is the best thing you can do for our community? On the 7th July 2006 I posted this request to all 87 National and Labour members of parliament, in the vain hope that I could get some help in getting this very important information out to every secondary school and public library in New Zealand. I have put in several requests to David Parker to help with this project, but again Ive received nothing. Obviously we dont have any concerned members in our government, basically if they cant see a potential vote catching project they are not interested.